Shopping for Universal Monsters Action Figures? Frankie has attitude! Under the full moon on a quiet yet treacherous mountain pass, a single headlight pierces the inky darkness. An engine roars. Tires squeal. A solitary figure speeds past; all the girls want him, all the guys want to be him, and one scientist wants him to get back to the lab ASAP. He is the Rebel Frankenstein! 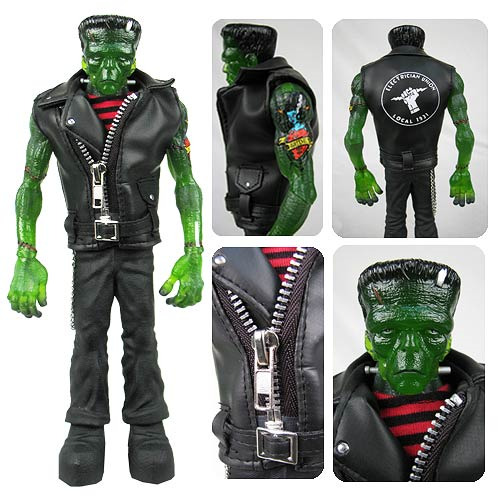 Assembled on the wrong side of the lab, this Frankenstein has attitude! He stands a monstrous 9-inches tall and features a sleeveless leather vest with his insignia, a real metal wallet chain on his belt, and a tattoo on his bicep. This limited edition monster is cast in a mysteriously translucent green plastic and features ten points of articulation. This Mezco Summer Exclusive is a limited edition of only 500 pieces! Ages 15 and up.